D.N. Dunlop (1868-1935) combined remarkable practical and organizational abilities in industry and commerce with gifted spiritual and esoteric capacities. A personal friend of W.B. Yeats and Rudolf Steiner, Dunlop was responsible for founding the World Power Conference (today the World Energy Council), and played leading roles in the Theosophical Society and later the Anthroposophical Society. In his business life he pioneered a cooperative approach towards the emerging global economy. Meyer's compelling narrative of Dunlop's life begins on the Isle of Arran, where the motherless boy is brought up by his grandfather. In a landscape rich with prehistoric standing stones, the young Dunlop has formative spiritual experiences. When his grandfather dies, he struggles for material survival, but devotedly studies occult literature. The scene moves to Dublin, where Dunlop becomes a friend of W.B. Yeats and the poet-seer A.E., and develops an active interest in Madame Blavatsky's Theosophy. 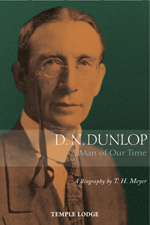 Arriving in London via New York, Dunlop is now a lecturer, writer and the editor of a monthly journal - but alongside his esoteric interests he rises to a foremost position in the British electrical industry, masterminding the first World Power Conference. Dunlop's life is to change forever through his meeting with Rudolf Steiner, which "...brought instant recognition". He was immediately convinced that Steiner was "...the Knower, the Initiate, the bearer of the Spirit to his age". Dunlop's close involvement with anthroposophy, leading to his eventual position as Chair of the British Society, is described in detail: from the momentous conferences in Penmaenmawr and Torquay to his transformative relationships with Eleanor Merry, W.J. Stein, Ita Wegman and Ludwig Polzer-Hoditz. Meyer features important material on the Anthroposophical Society's tragic split, that allows for a true evaluation of this difficult period in the organization's history. This second, enlarged edition features substantial additions of new material and an Afterword by Owen Barfield. T.H. MEYER was born in Switzerland in 1950. He is the founder and publisher of Perseus Verlag, Basel, and editor of the monthly journal Der Europaer. He is the author of several books including D.N. Dunlop, A Biography; Rudolf Steiner's Core Mission; The Bodhisattva Question; Clairvoyance and Consciousness and Reality, Truth and Evil, and editor of Light for the New Millennium. He has written numerous articles and gives seminars and lectures around the world.